TMS effectiveness is something I have spent a fair amount of time researching. Last year I gave two Grand Rounds presentations on this topic at the University of California, San Francisco and at the California Pacific Medical Center. But despite the compelling evidence that, if you have failed two (or maybe three) antidepressant trials for the treatment of your depression, your odds of responding to treatment with another antidepressant are extremely small, transcranial magnetic stimulation (TMS) has somehow not seeped into the consciousness of most psychiatrists. Why is that? Why has this treatment not taken off? There are many people with depression, many of those don’t have a good response to antidepressant medications. Some people may not even be able to take antidepressants. The largest and best designed clinical trial on the effectiveness of antidepressants for major depression, a study designed and funded by the National Institute for Mental Health (NIMH) called STAR-D, found that the likelihood of a good response to an antidepressant dropped off rapidly after one or two failed clinical trials. 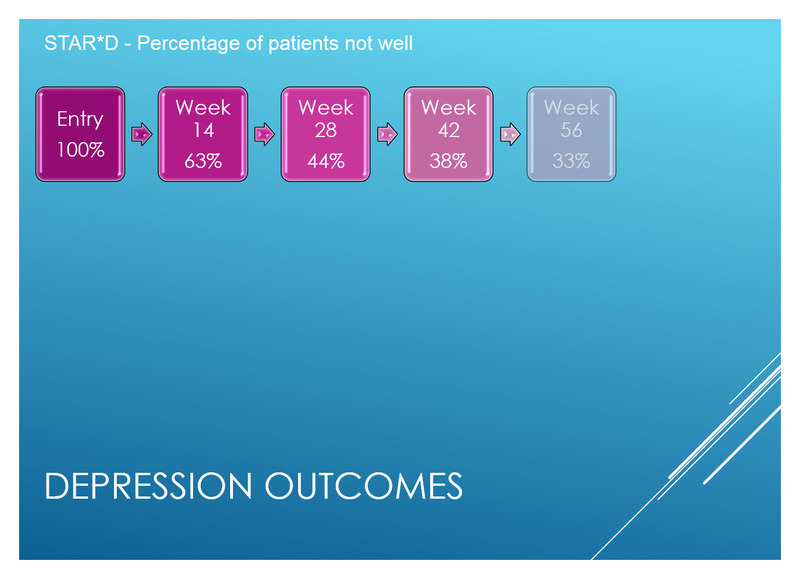 So, at entry to the study (see slide to the left) 100% of the patients were depressed (or they would not have been eligible) after one clinical trial (at week 14) 63% were depressed (36% had gotten well). After a second clinical trial (at week 28) 44% were depressed (56% had gotten well). 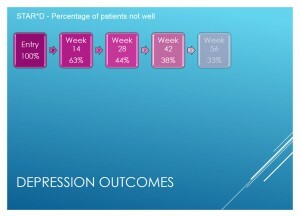 After a third clinical trial (at week 42) 38% were still depressed. In other words, between week 28 and week 42 only 6% of patients who had not yet responded to treatment got well. 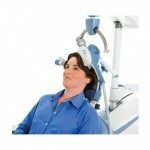 How about with TMS treatment? In the three best double blind placebo controlled studies (one of which was funded by the NIMH) the odds of recovery from TMS were 15 to 20%. 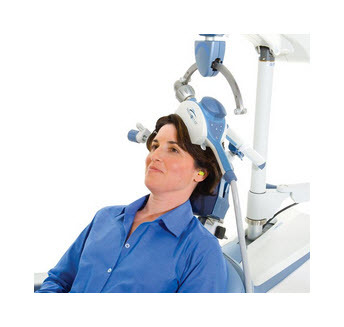 TMS was 2 to 3 times more effective than another antidepressant trial after two antidepressants had been tried. This is not a small difference. It is the kind of difference which, if we were talking about anything other than a psychiatric disorder, would have people clamoring for the treatment. 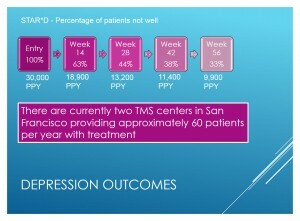 As I pointed out, there are two TMS centers in San Francisco. When I wrote the presentation, these two centers were providing no more than 60 patients per year with treatment. I wondered how many patients should be receiving treatment. 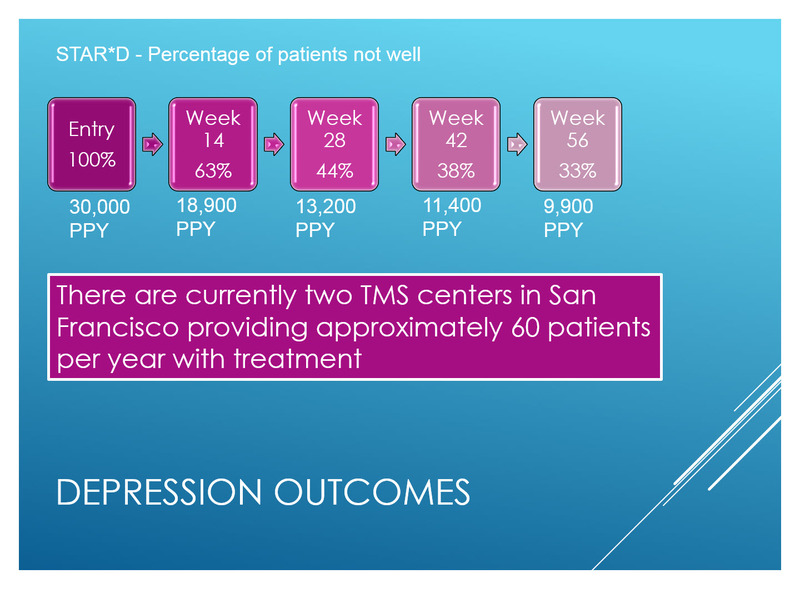 60 patients per year in San Francisco seemed extremely low, given what we know about how common depression is. For the sake of simplicity, I said that we should assume that San Francisco provides care for an area of perhaps 2 million inhabitants. The best estimates of the new occurrence of depression in the general population are that about 3% of all inhabitants will develop a major depression per year. 3% of 2 million is about 60,000 patients. However, we know that only about half of people with depression are treated in the mental health system. So that means we have 30,000 new patients per year seeking treatment for depression from mental health providers in San Francisco. Let’s assume that all of these people get an adequate trial of an effective antidepressant, after 14 weeks (one clinical trial) there would still be 18,900 patients with depression. At week 28 there would still be 13,200 depressed patients. But only 60 patients per year are getting TMS.